The liquid marinade consists of a good brand of reduced sodium gluten-free soy sauce, healthy lemon juice, and a respectable brand of hot sauce. Some healthy ingredients added are garlic powder and black pepper. The other source of heat is achieved from using Jalapeno pepper powder, which is healthy if eaten in moderation. The sugar level is high at 7 grams of sugar per 28 grams of jerky. For a sweet based flavor as we have here, our preference is 5 grams of sugar or less per 28 grams of jerky. The salt level is a little high at 380mg of salt per 28 grams of jerky. Our preference is 350mg of salt or less per 28 grams of jerky. 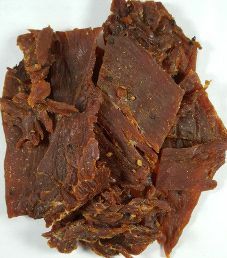 This jerky does qualify to be sodium nitrite free, or any other similar unhealthy preservatives. Instead, salt is the main preservative used here. With further kudos to Perky Jerky, there is no MSG added. 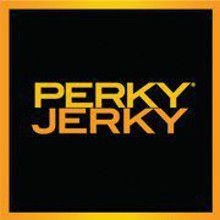 The Perky Jerky – Sweet & Snappy Turkey Jerky flavor begins with soy, some sweetness and saltiness. It does not take long for a nice little bite of spiciness to take notice. This flavor is not very spicy at approximately 2 out of 5 stars on the heat scale. This spiciness is really enjoyable and it will certainly not melt the fillings out of your mouth. The hot sauce is likely a delicious Tabasco Garlic Pepper Sauce type and it does taste great. 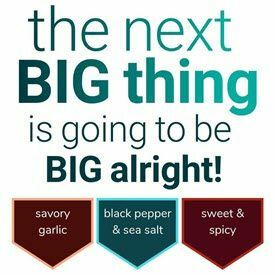 There is a slight taste of Jalapeno with light garlic and the cracked black pepper is more prominent. This jerky is fairly sweet and this sweetness balances the spiciness very well. A light level of acidity is noticeable with a “pineapple like” type flavor instead of the more acidic lemon. There is also a reasonable amount of natural turkey flavor present. Although not entirely consistent throughout, the cracked black pepper flavor is mostly great and very enjoyable. These strips of jerky are small to medium in size and borderline thinly sliced. The texture is rather on the soft and tender side and chewing these strips is reasonably easy. While these strips are sticky, there is no oily residue left on your fingers while handling them. 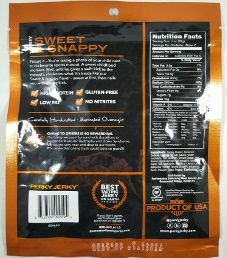 This is a bold and very addictive jerky and at a glance the overall list of ingredients quickly indicated that we were in for a big treat. While this jerky packs tons of great flavors, the spiciness is quite subtle. In all fairness, this flavor is advertised as: “A little bit sweet, a little bit spicy” and delivers on its claim. 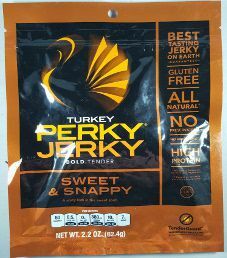 Perky Jerky also states to have “The Best Tasting Jerky on Earth” and until now, we never knew Turkey jerky could tastes so good. This jerky taste so good and the texture so pleasant and inviting, it was challenging to tell that it was actually turkey. We’re not typically big turkey fans and as Paul said: “I can’t remember turkey jerky tasting this good”. We can tell without hesitation, we’ve been completely converted by Perky Jerky and gained a new perspective on turkey jerky. As a matter of fact, this jerky is so tasty. I placed my little jerky baggy inside my lunch bag on top of the fridge last night. I have two little kittens and when I got downstairs this morning, they had knocked my lunch bag on the floor and ate all my precious jerky. I was so pissed of losing my delightful treat that I could have cranked both their little necks, no question asked. Instead, I took a deep breath and came to work. I can’t really be mad or blame them. After all, they too certainly know a great jerky when they see one. We’d recommend the Perky Jerky – Sweet & Snappy Turkey Jerky to anybody who enjoys a sweet and spicy flavor and loves the great taste of hot peppers without the burning sensation. We were so impressed and we’ve enjoyed this Turkey Jerky so much, we’ve awarded a perfect 10/10 taste rating. Two thumbs up! This 2.2 ounce/62.4 gram bag of jerky sold for $5.99, That equates to where the regular price is $5.99. That equates to $2.72 an ounce, which classifies as an average price. Some Perky Jerky slogans printed on this bag are “Bold. Tender.” and “Best Tasting Jerky on Earth Guaranteed”. Some facts printed on this bag are “Gluten Free”, “All Natural”, “No Preservatives”, “No Added MSG”, “High Protein”, “Minimally Processed, No Artificial Ingredients”, “Carefully Handcrafted”, “Marinated Overnight”, and “Product of USA”. Some Per Serving facts displayed are 80 calories, 0.5g Total Fat, 0g of Saturated Fat, 380mg of Sodium, 10g of Protein, and 7 grams of sugar. All bag categories are covered here with one exception. This bag has no transparent window to view the actual jerky. In fairness, a TenderGuard windowless packaging is displayed to ensure maximum freshness. Nevertheless, even just a tiny transparent window would be appreciated. There is an interesting blurb written on the back about this jerky. To their credit, both an email address and toll free number is provided for customer inquiries. You are encouraged to visit the Perky Jerky Twitter, Facebook, and Instagram pages using their social media handle @perkyjerky. Commendably, a guaranteed satisfaction policy is in place.